Rolling Hills of the Borders (Matt McGinn) * Gallant Murray (Trad) * The Broom (Trad) * Scots Abroad (Ian McCalman) * Instrumental (Nick Keir) * Come By the Hills (W. Gordon Smith) * Let’s Recycle (Ian McCalman) * Corryvreckan Calling (Nick Keir) * Ye Jacobites By Name (Trad) * 12 Folk Days of Christmas (Keir/McCalman) * Scotland’s Story (Craig & Charlie Reid) * Moor Road (Ian McCalman) * Still Gonna Die (Shel Silverstein) * Hallelujah (Leonard Cohen) * Rise Rise (Trad) * The Bonnyrigg Banker (Ian McCalman) * Leaving Denmark (Ian McCalman) * Don’t Sit on My Jimmy Shands (Richard Thompson) * Caledonia (Dougie MacLean) * Wrecked Again (Ian McCalman) * Skye Boat Song (Trad) * Westering Home (Trad) * So the Years Roll On (Ian McCalman). Seagull Cry (Ian McCalman) * Mothers Daughters Wives (Judy Small) * Green Grow the Rashes (Robert Burns) * The Last Leviathan (Andy Barnes) * Kirsteen (Trad). The Holly She Bears A Berry * Lucky Puppy (introduction) * Embarrassing shanties and Derek’s only interview. * Dido Bendigo and Snow White * Pav (introduction) * White Christmas at the hottest Tønder Festival. * Who’s the guy in the front row? * The Bells Of The Town and the art of drinking. * Johnnie Cope * 23rd Of June (or some of it). After at least 26 albums, countless television series, world tours in every direction, this really is it. This is the McCalmans last ever live show. 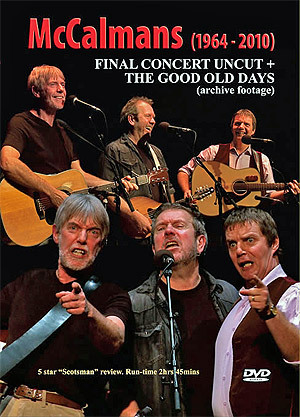 They have been a part of the Scottish folk scene since 1964, are one of Scotland’s most popular and enduring vocal harmony groups, known around the world for their strong vocals, their prolific output of new songs and their idiosyncratic chat on stage.